Its the first time I've tried a nail polish from the Boots line 17. I'm not too impressed, nor am I disappointed with this product. Just so so. Application wasn't a dream, but it wasn't too bad either. 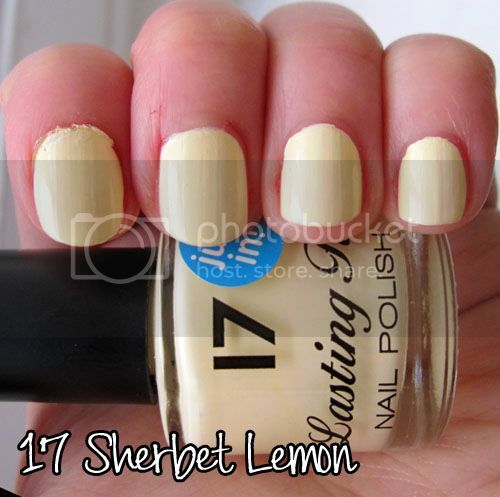 I like that its quite thick and only requires two coats to get it opaque. However, I don't like brush lines being too obvious. Cute color but the brush lines... tsk. hmm, i have yet try anything frm that line yet. the color is lovely & cheaper dupe to china glaze. hmm how would you compare with barry m formula? It is a little too pastel-ish. However, I think it's a yummy color. Makes me crave mangos, lemmons and all the citris fruits.